The seam between Texas and Mexico has created a fabric of American life filled with a citizenry who converse in a mix of Spanish and English and who may quench their thirst with a “michelada” while satiating their hunger with a sirloin steak. Their lives, family and work extend across the international line. 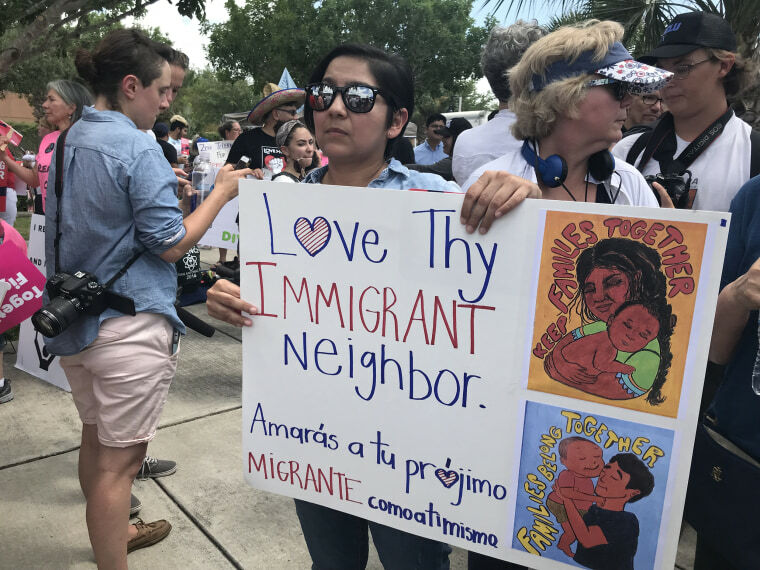 Constantino, 34, was one of a few hundred people who took part in a protest last week outside the federal courthouse in Brownsville, which is in Texas’ southernmost tip and just across the Rio Grande from Matamoros, Mexico. Born in Los Fresnos, Texas, about 17 miles north, Constantino’s family went back to Mexico when she was 4 and then returned later. Constantino told NBC News she feels immigration authorities’ presence in the Rio Grande Valley has become more aggressive. “It’s a symbiotic relationship we’ve had with each other,” she said. 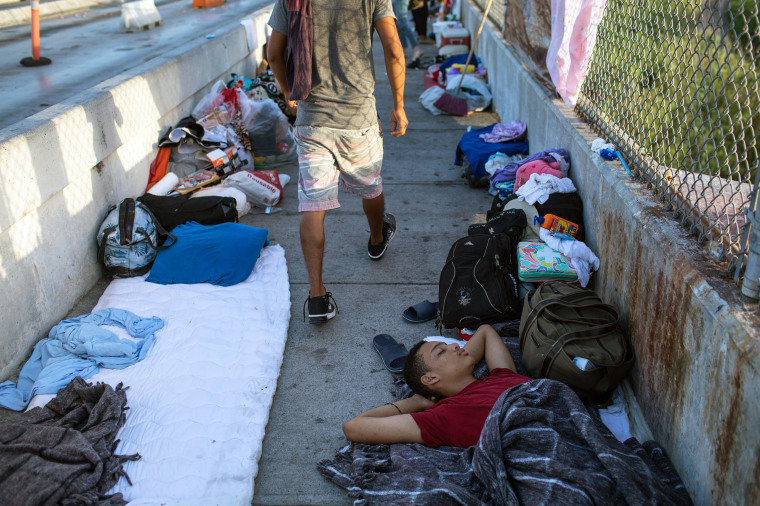 Thousands of vehicles and pedestrians flow back and forth across the border, legally engaging in the commerce that makes Mexico the United States’ third-largest trading partner and the United States, Mexico’s largest. Many residents know that amid that flow are goods and people who cross illicitly, some to do harm but many hoping to escape violence, poverty and oppression, as some of these residents’ know their ancestors may have done. There are 16,605 Border Patrol agents on the nearly 2,000-mile Texas-Mexico border, guarding areas that are between the U.S. ports of entry, which are the legal entry points for immigrants. Texas’ Rio Grande Valley sector has the most agents with 3,130. In addition to stopping illegal immigration, they seize hundreds of thousands of pounds of illegal drugs each year. But illegal immigration has hit historical lows. Despite spikes in recent months, the number of apprehensions from October to May of 2018 (the first eight months of the fiscal year), 256,857, is less than what it was during the same period the previous year, 310,531. That’s also substantially lower than in 2016, when the number was 415,816. Apprehensions vary by sector and the Rio Grande Valley sector, with six stations on the border, has actually seen a drop in arrests of families and unaccompanied childrencrossing the border illegally during the period from October to May. 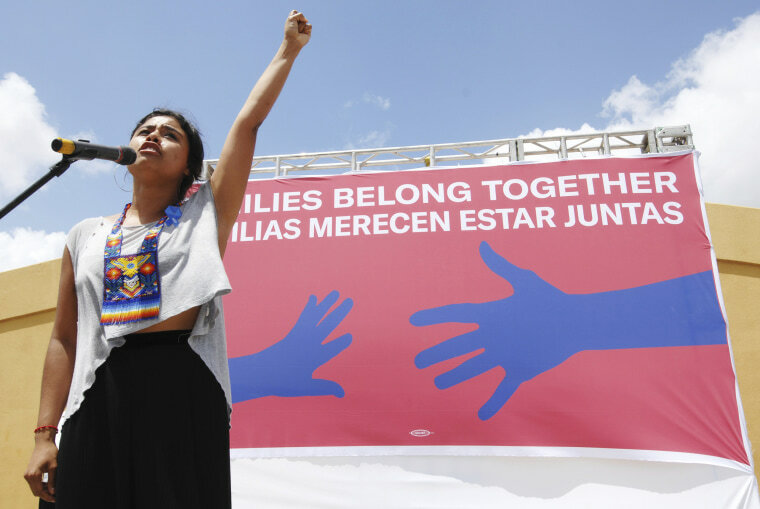 The Trump zero-tolerance policy of prosecuting all people charged with entering the U.S. illegally and separating families from children began in earnest in the Rio Grande Valley in the second week of May. 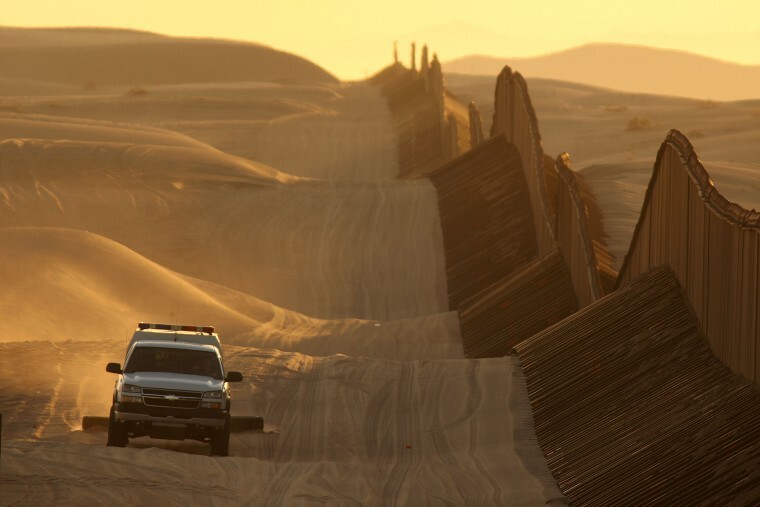 In an interview for NBC Dateline’s report “The Dividing Line” that aired Monday, Rio Grande Valley Border Patrol Sector Chief Manuel Padilla said there is an adversarial relationship between Border Patrol and humanitarian groups, largely by virtue of the focus of their missions. “But it doesn’t have to be adversarial. I have many a good friends that came together to develop initiatives in order to save lives. And saving lives by working together — educating people not to place their lives in the hands of smugglers — identifying smugglers … and just collectively working to save lives where the two missions or the purposes meet,” Padilla said. Sepulveda and Yoder, who had stopped at a McAllen gas station, say there’s need for a strong Border Patrol presence, perhaps more of one, and they feel safe in McAllen when they see it. 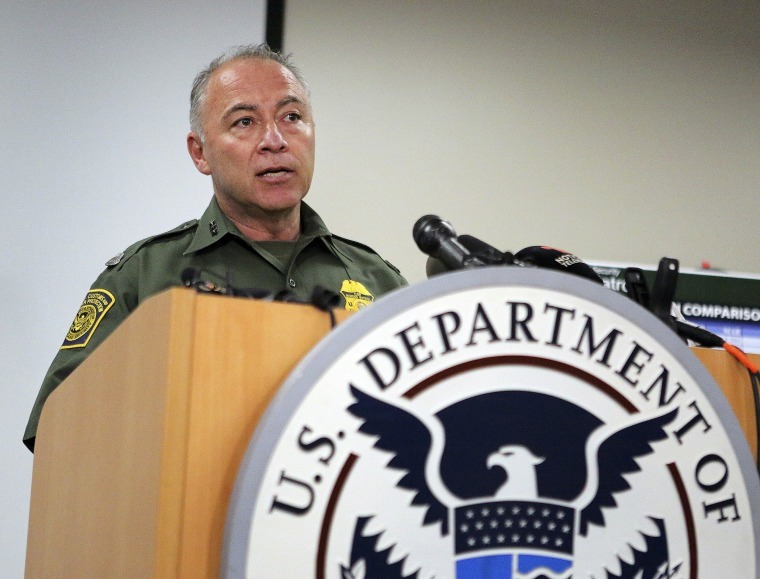 “They are doing what they need to do,” Sepulveda said of the Border Patrol. “Not a day goes by we don’t see a story about a stash house (where immigrants are held until smugglers are paid) being found,” he said. “I don’t like that,” Yoder said. 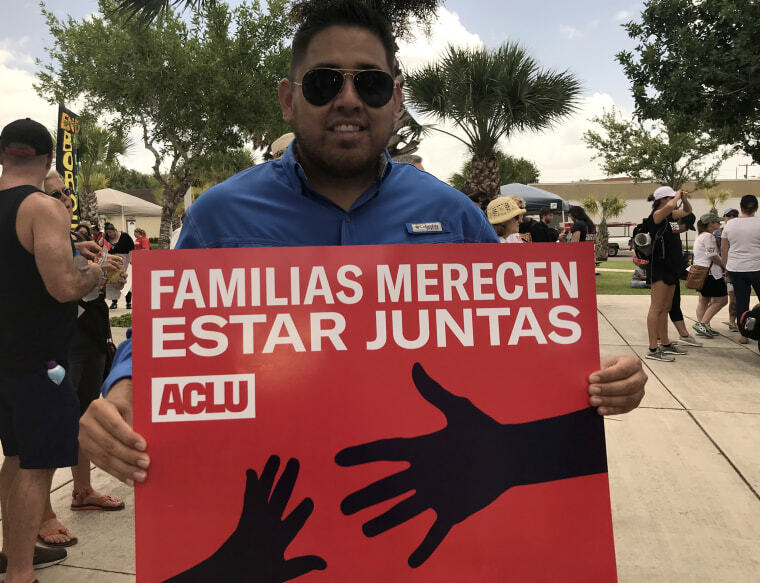 Benavides, originally from San Benito, Texas — the birthplace of the bilingual country, rock ‘n roll and Tejano musician Freddy Fender — said he was so disturbed by the Trump administration’s forced family separations, he felt compelled to participate in the protest. 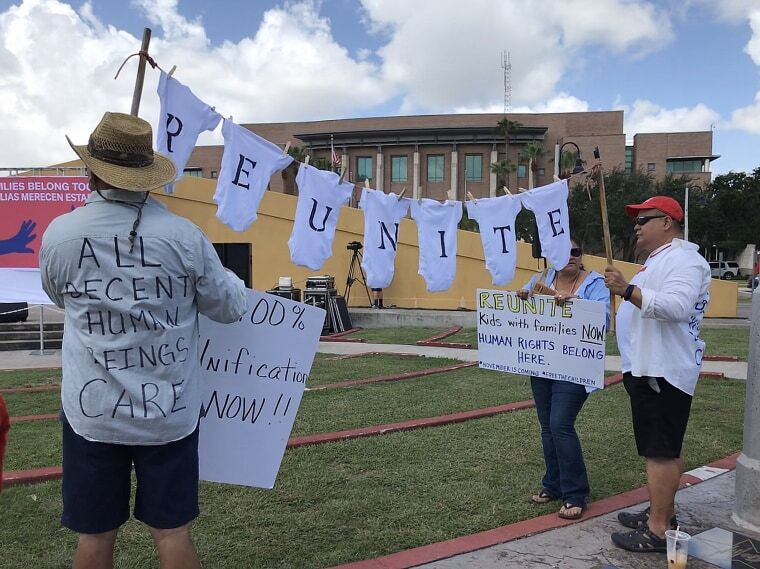 He and his friend Sergio Cordova, 51, born and raised in Brownsville, held a homemade “clothesline” on which they had hung seven baby “onesies.” The onesies were stenciled with the black letters R-E-U-N-I-T-E.
His indignation rose as he saw reports that CBP officers were stopping people from seeking asylum on international bridges so they could not get to the port of entry to make the claim. The child separations, however, were the heartbreaker, the “straw that broke the camel’s back,” he said.